Autumn is the season in which you can often feel a little depressed, lethargic, and indecisive. The ancient Chinese discovered that autumn relates to the lungs and large intestine. brown rice, miso, lentils,tofu, tempeh, sturdy greens & root vegetables, varied seaweed vegetables, cooked seasonal fruits, ginger, onions, and garlic. As the lungs and large intestine are nourished, you’ll notice that your thinking becomes clearer, you’ll have more energy and feel more optimistic as well as more connected to life and people. With the seasonal change from late summer to autumn, we tend towards heartier and richer dishes. A little more sea salt and oil, which warms the body, is used, along with fewer raw foods. Salads are lightly boiled, and vegetables are cut into larger chunks for longer cooking. Rice, which is harvested around this time, is the most suitable grain. Stews, deep-fried vegetables, soups, and longer sauteeing dishes are all ideal ways to get in tune with the season. In the ancient 5-Element theory, Autumn relates to the Metal element which includes the Large Intestine and Lungs meridians. When the Lung Meridian is functioning well, we feel more optimistic, joyful and trusting in ourselves and others. 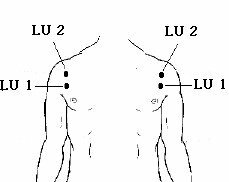 Lung Meridian Point 2 – LU 2 is located in the depression below outer extremity of clavicle. Lung Meridian Point 1 – LU 1 is located 3 finger-widths below LU 2. Both points can offer symptomatic relief from asthma. Bring millet, cauliflowerets, onion, water, and sea salt to boil in a medium-sized saucepan. Lower heat, cover, and simmer for 30 minutes. While millet is simmering, prepare tofu cream dressing. Boil tofu for 1 minute, drain, and place in blender with remaining dressing ingredients. Puree until creamy. Refrigerate. Puree cooked millet mixture in a food mill placed over a large mixing bowl. Form millet mixture into patties using about 2 tablespoons of mixture for each. Pan fry pancakes until light brown on both sides. Serve garnished with 1 tablespoon of tofu cream on each one. This pose strengthens the back and spine, massages and realigns the internal organs. 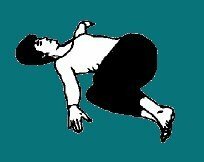 Lie on your back with arms at 90 degrees to the body. Inhale and bring the knees to the chest. Exhale roll the hips to one side, while turning the head to the other side. Allow the knees to touch the floor while trying to keep the shoulders flat on the floor. Inhale and bring the knees up with head to centre. Exhale and repeat to the other side. Centaury is for people who find it difficult to say ‘no’ to others. easily be taken advantage of. So, instead of being a wi?lling servant, the Centaury person can end up as the slave to other people’s wishes. 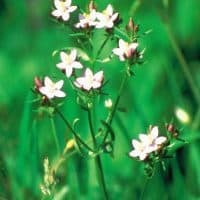 Taking the Centaury remedy supports the development of courage and self-determination. It enables a person to draw a line in the sand and make space where we they can be themselves. In doing this they find that it’s OK to say “yes” to oneself and “no” to others without feeling guilty. A short 6-minute guided meditation for letting go of whatever you’re holding on to or is holding you back.